Piano Nobile is pleased to present Cyril Mann: The Solid Shadow Paintings. Between 1951 and 1957 Mann undertook an explosive programme of work, representing ordinary objects with boldly outlined shadows and bright, sometimes luminous colour. A dazzling interjection in the subdued art world of fifties Britain, these works have never been displayed together and the exhibition offers an exciting insight into the artist’s radiant formal language. Though Mann spent the rest of his career painting natural light, the solid shadow paintings were made under the glow of an electric lightbulb. 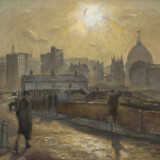 After moving into a flat at Old Street with no daylight, Mann’s pictures began to course with unnatural, electric colour. For the first time, he noticed the line that joins together an object with the shadow it casts. He depicted this line in his paintings as if it were itself a solid object, laid on the table before him beside apples and Pelican paperbacks. Mann’s solid shadow period was his most original, and it stands as his lasting contribution to the history of twentieth-century art. Mann's work prefigured the work of several prominent transatlantic artists. An accompanying display of work by Patrick Caulfield, Michael Craig-Martin, Euan Uglow and the American pop artist John Wesley will be shown at the gallery alongside Mann's still-life paintings. The exhibition will be accompanied by a fully-illustrated catalogue. For a list of available works and a catalogue please contact the gallery. A major retrospective of Mann’s work, Cyril Mann: Painter of Light and Shadow, will be held at The Lightbox, Woking, between 12 January and 31 March 2019.